What tricks do you use to make it through a particularly long day at work? How do you cope with a never ending to-do list? Perhaps you give yourself a reward – like a walk to the local coffee shop to buy a pick-me-up dose of caffeine. Or maybe you wait until week’s end in order to reward yourself with a lunch out. Or perhaps you ‘reward’ yourself with a work environment that is inspiring and conducive to getting work done. One of my favorite ‘rewards’ (and you can do it any time) is to use essential oils in the office. Not only do the essential oils make the office smell great, but they can give a wonderful boost to how you feel. If you haven’t tried essential oils in your work space before, here is an overview of why you should consider them. There is also a list of oils to get you started. Essential oils are the most basic piece of flowers, herbs, and trees, distilled into an oil form. They’re of course distinguished by their scents, but those scents differ and offer a variety of benefits for you. For example, some might help you relax while others will wake you up. 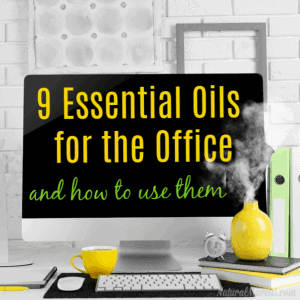 Using essential oils for office productivity is a great idea because they can help you work better. The way essential oils work means they will provide aromatic and physiological benefits. Each day your mood and the way you feel will be different. Depending on what you need and the day ahead, you can choose an oil, or blend of oils, to suit. Need to get some energy into your day? Try peppermint, lemongrass or bergamot essential oils. Do you want to focus and concentrate on getting it done? Grab the rosemary oil bottle. Check out the graphic below for ideas on how to use essential oils in the office or at work (my favorite is diffusing). If you don’t have a diffuser, there are still some options that work just as well. Start with this list of 9 essential oils – they are perfect to begin with and offer a range of benefits. Use them alone or mix and match as needed. For example, if there is meeting scheduled that requires calm, try diffusing a blend of geranium, chamomile and clove oils. Some good additions to the list are the citrus oils – orange, lemon and grapefruit. All are uplifting and energizing – perfect for setting a productive mood. When you are ready to experiment with more oils, try some of these essential oil blends. Using essential oils in the office is like a little reward every day. They will help you be more productive, boost your mood and of course, make your office smell wonderful. Pick one or two oils from the list above and start smashing your to-do list today.